They were great, everything went like clockwork. The choice of music had everyone on the dance floor. Very gracious and helpful and I would recommend him any day. It went brilliantly. The DJ was awesome. We will be definitely using your services for all our functions. Everything was 10 out 10. The DJ was just brilliant. Played beautiful music during dinner, played music after dinner to get everyone onto the dance floor. We couldn't have asked for any better DJ. The perfect DJ for our party. We had such a cross section of ages that he was brilliant in making sure we all had a little bit of genre played. Thank you for contributing to a fantastic night. Thank you for making the hiring of your Jukebox/Karaoke so easy. All my interactions with your business was seamless and any query actioned promptly. The system was also fabulous. Good morning. Thank you so much for a great DJ. The DJ was amazing! Such a lovely person and everyone was on the dance floor at all times. She did a fantastic job. The DJ was Absolutely amazing! Friendly, prompt, helpful. Well done to him. Thank you for your excellent service, the jukebox was the perfect addition to our function. We will definitely recommend your business to family and friends. Everything was amazing and honest. We mistakenly put $50 extra in the envelope for payment. The DJ came back telling us there was too much and gave the money back. She did a great job. Very happy customer. The whole night was a success. Everything about the DJ was perfect as was the office staff, very courteous and helpful. 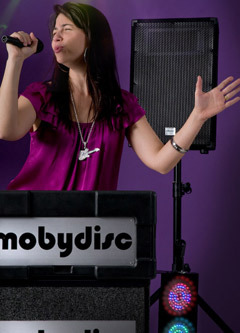 We booked Mobydisc as our wedding DJ and MC. Our DJ was perfect! He was fun and had everyone up and dancing. I can't thank you enough for helping me out today. Mate you got yourself a customer for life. I will definitely recommend you to my family and friends. I just wanted to thank you for playing at our 50th birthday party. It was fantastic, I have already recommended you to a friend. We had a ball. The DJ was excellent. We would like to book him for next year. It was great, everyone had fun as it was easy entertainment. Our DJ was fantastic with a very rowdy bunch of pre-teens. He kept them entertained and they had an absolute blast. I just wanted to thank you again for playing at our Christmas party to put on an amazing night. It was everything we wanted. The focal point of the party was definitely the Jukebox - with guests of all ages, there was something for everyone. The DJ we had for our clients Christmas party was awesome. He really joined in the spirit and we had a wonderful time. The DJ was outstanding. She read the crowd perfectly and was an absolute pleasure to deal with. From the start of organising our function with the office and then our DJ, everything was a success. I am very happy with MOBYDISC. Our DJ was just wonderful, she had a wonderful friendly nature and was easy going and happy. Having the Jukebox at our function made the evening. It was a huge success and we definitely hope to have a good reason to hire from you again. The DJ had everyone up and dancing. There was a lull of a couple of songs , but that was because people were exhausted and catching a breather. Thank you it was a brilliant night she helped make it ROCK! Your DJ did a fabulous job at our presentation evening. Your company fitted our presentation night in the last minute and you where most helpful. We will be requiring your services next year. We really loved having the Jukebox/Karaoke. Lots of people commented on how great it was to have. The DJ did a fabulous job. Played off our list & accommodated guests requests. He was the best, a night to be remembered. © 2017 Mobydisc Mobile DJs.